We live in a world where storage space is constantly shrinking. 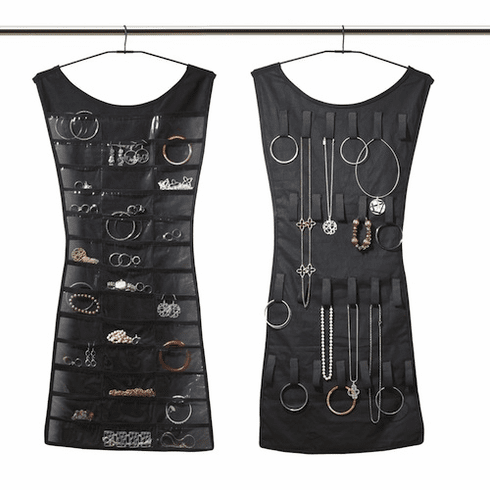 The Little Black Dress jewelry organizer from Umbra is a super-thin, double-sided storage solution for jewelry, cosmetics, hair and fashion accessories, and all of life's curiosities. 39 clear pockets on one side hold earrings, rings, watches, pins, make-up and other small items. On the reverse, 24 tabs with hook-and-loop closures accommodate long necklaces, chunky bracelets, and other bulky items like headbands, belts, and scarves that most pocket organizers don't fit. The metal hanger can hang on a closet pole, wall or back of a door and the swiveling head provides easy access to both sides. With a simple flip, contents are visible at a glance. Measures 42-inch long by 18-inch wide. This is one LBD that always fits and never goes out of style! Patent pending design by Matt Carr exclusively for Umbra - the worldwide leader in casual, contemporary and affordable design for the home.